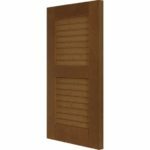 Louvered composite shutters are designed to resemble the distinct profile of wood louvered shutters. 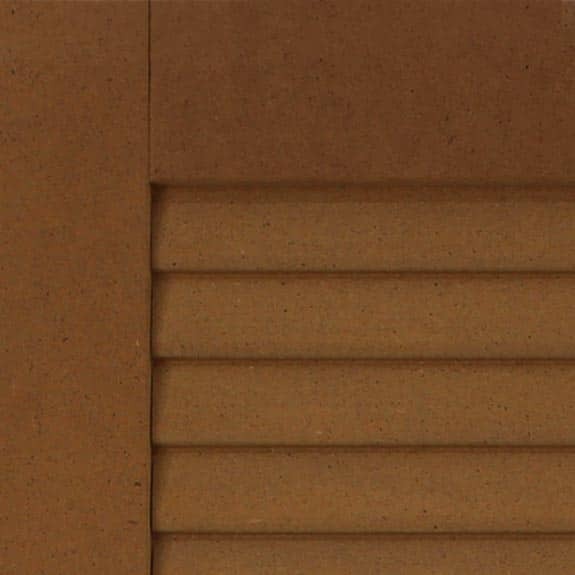 Composite shutters are constructed from Extira™, a solid pressed durable material. It is virtually impervious to moisture, rot, and termites, insuring an extremely long life. 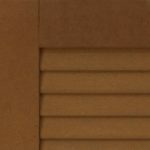 Unlike wood shutters that use multiple slats, composite louvers are shaped from a single piece with no space between louvers. 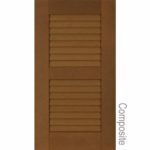 Louvered composite shutters have only one presentable side making them only suitable in a stationary position. Exterior window shutters can be installed to be functional (swing open and closed), but most often are stationary. Non-functional exterior shutters require less precise measurements than those that operate. Measure each window width from the outside edge of window trim to the same spot on the opposite side. Calculate the shutter panel width, starting with the smallest window. Window widths narrower than 60 inches can appear to have functional louvered composite shutters by ordering panels half of the window width. Windows larger than 60 inches, while unable to appear functional, should use panel sizes between 30% and 50% of the window width. Consider panel widths of narrow windows when determining panel widths for larger windows. Do not exceed a house shutter width greater than 50% of the window. 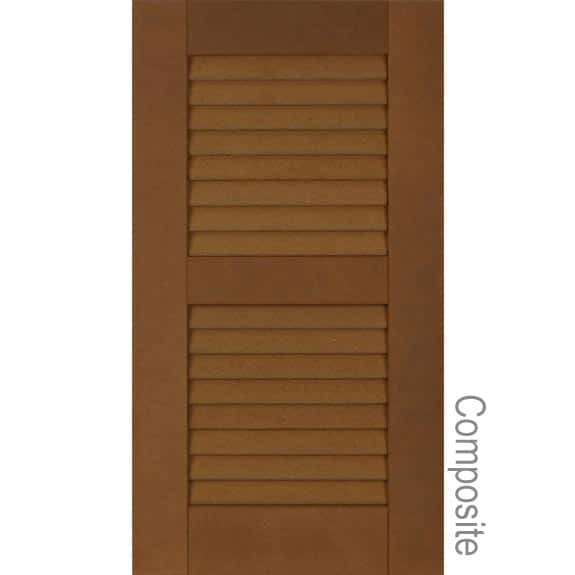 A divider rail on composite louvered shutters can be located at a standard or custom location. To specify a custom location, provide the measurement from the bottom of the shutter to the center of the divider. See measuring instructions for functional louvered shutters in greater overall detail. ShutterLand exterior louvered composite shutters require approximately 4 weeks to manufacture. Production times may be shorter or longer depending on the number of orders in house, holidays, size of order, finishing, or a number of other considerations. We do not guarantee production or shipping times. 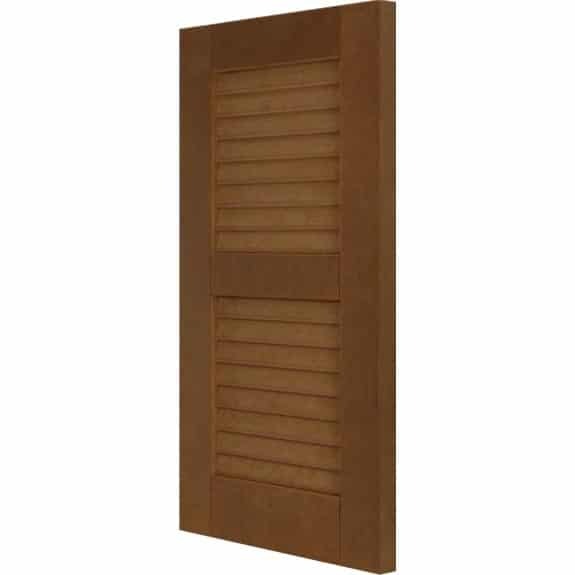 We ship all louvered exterior composite shutters from our manufacturing facility in Alabama. We generally ship using FedEx Ground across America, usually resulting in a shipping period under one week.